I’ve crocheted all my life. Well, since I taught myself from a Woman’s Day lift out in 1958 anyway….If you’re figuring, that’s 56 years ago! I’ve done all sorts of things of course. Toys and edgings and bags… Then, in the exciting ’60s, lovely lacy Banlon dresses with chains at the waist. You had to be there….. Anyway, I never associated my love of crocheting with art. Even recently, when I began preparing work for the MELD exhibition (see http://meldarts.wordpress.com ) I didn’t consider doing anything in crochet. I have done several workshops with Prudence Mapstone just for the joy of using a wonderful array of yarns creatively but still I didn’t think of actually making EXHIBITION work out of crochet! However, when the MELD group decided that each of us should include some 3D pieces in the exhibition at the end of this year, I began playing with the idea of some vessels in crochet with wire and wood. My experiments with that idea has led me to research crochet a bit more. Which in turn led me to buy “The Fine Art of Crochet” by Gwen Blakley Kinsler. Basically, Kinsler is a long time champion of crochet. She sets out to demonstrate the contemporary artistic relevance of this medium by showcasing the work of twenty artists. I found the book incredibly affirming. Of course , I was sensitised to it by my work, which I was constructing against a background feeling that it wasn’t really going to cut it in the art world because it was “just crochet”. The first affirmation came when on page 4, in the Introduction, I found a reference to my heroine Prudence Mapstone. Then immediately after that, still in the Introduction, I read of the work of Janet de Boer and TAFTA. Remember, this book was published in America; not a country renowned for its awareness of anyone or anything outside of its borders. Affirmation squared, if you like, came via Kinsley’s selection of artists. All of them are using crochet as a very considered, even purposeful, medium for their message. Each of them acknowledges (and uses) the cultural content of crochet while adding contemporary messages with it. The resultant work is redolent with meaning; layers of meaning. Yet , if you don’t want to bother with all that symbolism, you can just enjoy the beauty (for the most part; they are not all , IMHO, attractive!) of the pieces of work. Anyway, I am now approaching the design and execution of my vessels with renewed confidence as a result of Kinsler’s book. It may sound pathetic to be claiming to now be a bit more independent in one’s choice of medium. OK, I’m pathetic. 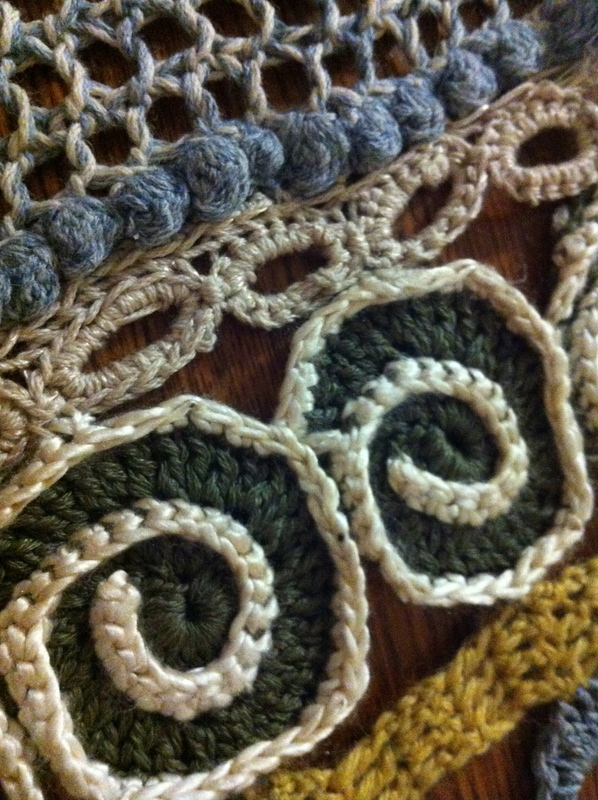 I have been apologetic and doubtful about the validity of using crochet to say something. Just now, I’m not. Hopefully, this feeling will last! Why should crochet be any different from any other textile medium, for example, hand stitching – they’ve all been marginalised as women’s domestic work but are still used to create art. Go for it Margaret!